11/9/2010Share this story on Facebook! 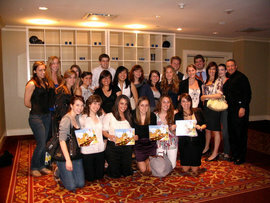 IC's 2010 Ad Lab team after winning second place in their district. Photo courtesy of Mallory Diamond. Shane Pisko '10 (IMC major) makes the team's pitch with Madison Tyler '10 (IMC major). 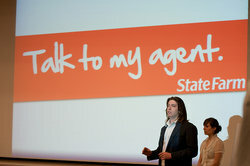 Ad Lab’s “Talk to My Agent” campaign for State Farm focused on reaching 18- to 25-year-old consumers. The fully integrated campaign featured pop culture–themed ads in multiple media channels, including print, television, online, branded events, and mobile apps, and encouraged consumers to get their own State Farm agent for matchless customer service. This semester's Ad Lab class is going for the top prize! The team traveled to New York City in May to compete in the American Advertising Federation's National Student Advertising Competition, where they won in District 2 for their campaign for this year's client, JCPenney. Next stop is San Diego in June to compete for the national championship. It ended with a rush. We were 26 future communications industry leaders, dressed in our best business-casual, hurrying through downtown Manhattan. I remember the mounting excitement as we navigated construction sites, subway stations, and a maze of corporate skyscrapers to reach the Downtown Marriott on time. Our campaign for State Farm was finally complete, and we had precious little time to set up for the pitch. Let’s back up to four months prior, when I decided to enroll in one of the most intense senior capstone courses in the Roy H. Park School of Communications. Ad Lab is Ithaca College’s version of boot camp for the annual National Student Advertising Competition, sponsored by the American Advertising Federation. Since 1973, one company has sponsored the competition every year, offering up its brand as the “client,” along with a unique brand challenge. (Some past clients: Coca-Cola, AOL, Bank of America, and Pizza Hut.) Ad Lab teams compete against the best communications schools in the country for a shot at nationals. An Ithaca College team has achieved the ultimate glory of “best in show” only once, with its campaign for auto manufacturer Saturn in 1993—but that hasn’t stopped us from passionately chasing the title every year since. Most integrated marketing communications majors choose this capstone course because of its close similarity to the advertising world, where high-pressure situations and creative challenges abound. The course addresses all aspects of campaign development, including research, creative development, media buying, deck design, and presentation strategy. For students who want to become communications professionals, the benefits the course offers are immeasurable. Ad Lab is the ultimate simulation of a full-service ad agency, representing the culmination of four years’ worth of academic study, and a true test of resourcefulness, endurance, and skill. Sure, there is the potential to shamelessly build your résumé. But for true Ad Labbers, it’s more about the journey. Our mini ad agency, which evolved over time into Vault Communications, was largely student-run. Professor Scott Hamula, our agency adviser, mostly left us to our own successes and failures, and we became more independent in our work as the semester progressed. We elected department directors on day one and formed committees of editors and designers along the way. I served as department director of account planning. I facilitated focus groups, directed consumer research, wrote our creative brief, and hunted for key insights to guide campaign development. These initial efforts fueled a small army of creative thinkers who, after setting up camp in a tiny room near the Park School and collectively consuming a huge amount of junk food, dreamt up brilliant ideas for our auto insurance client. Four long months of research, road blocks, game-changing ideas, revisions, team triumphs, late-night meetings, and even later-night meetings carried us to the Big Apple as a team. In my biased opinion, we delivered a great pitch, but when the dust settled, we were awarded second place in our district. It was both a heartbreaking and proud moment for me and, I imagine, for my teammates. No matter the outcome, we all had a blast. Ad Lab contributed hugely to landing my first job post-grad. I am currently the marketing coordinator at Partners + Napier, an independent, full-service ideas agency headquartered in Rochester, New York (the agency was recently named an Advertising Age Small Agency of the Year). Working on a great team in the pursuit of new business opportunities is still my biggest passion. I often think back to Ad Lab and everything it meant to helping me get where I am today, and everything it will come to mean as I continue in my career. Let me conclude honestly, and with great fondness: Ad Lab is tough. But for the true ad geeks out there—the dreamers, the designers, the ones who start reading Nielsen ratings at the age of five—for the tenacious, inspired, heart-and-soul warriors of the ad world, there’s nothing else like it. Are you a prospective student with college planning questions? Then myIthaca has got you covered. 130+ Ithaca Places to Eat, Shop, Play, and More! Copyright © Ithaca College. All rights reserved. Fuse is a student produced publication about the Ithaca College experience. All content in the print and web versions of Fuse is developed by current Ithaca College students in a breadth of different areas of study.